The market for improved off-grid lighting has rapidly developed in recent years, from a nascent and emerging set of solar-LED lamps to a big business with several million products being sold annually. Replacing fuel-based lighting with rechargeable, efficient lighting can provide higher quality, less expensive lighting services to end-users reduce health risks and mitigate the greenhouse gas impact of lighting technology use. As the market develops, critical questions about the way to appropriately measure impacts of improved lighting on peoples’ lives remain. 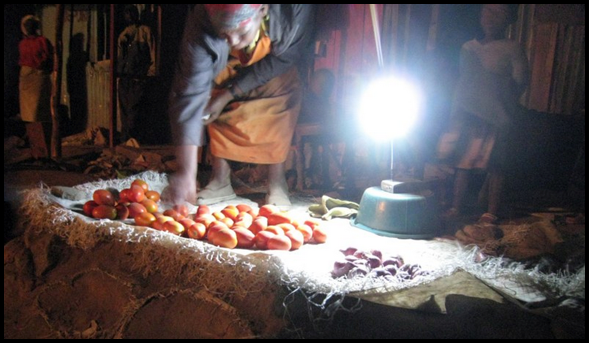 The population we studied was night market vendors who operate in two towns in the Rift Valley Province, Kenya and rely on off-grid lighting to illuminate their businesses. After conducting and initial baseline survey of 50 vendors, we made detailed measurements for a subset (n=23) of them and offered the subset the opportunity to purchase an LED task light, with or without solar charging. Fourteen chose to purchase the LED task light. One purchased the optional solar panel (others opting to recharge through local phone-charging enterprises). In a previous report we focused on the baseline economics of off-grid lighting for the study group and documented many of our field methods for measuring fuel-based lighting use. We also documented self-reported qualitative user feedback and the demand for lighting service. This study summarizes work that was completed in two small towns in Kenya circa 2008-2009—the “early days” of the Kenya solar-LED market—to understand the dynamics of adoption. The methods we used combine social geography with energy and technology analysis to understand LED lighting adoption patterns in the context of a market that is getting its first exposure to LED technology, a situation that is repeating itself in villages and towns across the developing world. True cost of kerosene – The cost is closely linked to world oil prices but includes additional contributions from geographic scarcity (higher prices in rural areas where there is little competition on a hyper-local, block-by-block basis). Measuring fuel consumption – We employed a range of techniques to measure baseline fuel consumption and find that high frequency surveys of kerosene expenditure combined with reliable information on the true cost of kerosene are a useful and relatively accurate way to estimate consumption and expenditures. Alternative methods for measuring consumption include rigorous (and expensive) field monitoring of mass balances for kerosene and historical recall surveys; we compare the results from each method. Embedded data-logging – We deployed and monitored detailed use patterns of LED lights. The method is promising for understanding peoples’ use patterns and the driving factors for operating under conditions of energy scarcity. Diversity of baselines and impacts ­– Off-grid lighting users have diverse patterns of use and needs for light. Even among the relatively homogeneous population we worked with, night market vendors, there is wide divergence in the baseline use of fuel and impact of LED lighting adoption. Willingness to pay – Of 23 night vendors to whom we offered LED lanterns at realistic market prices, 14 (61%) opted to purchase (cash  or financing ), albeit under unique circumstances of participating in a long-term field study. They were offered a single style and model of lantern, with technology of a late-2000’s vintage. Uptake could well be higher at present with contemporary technology options and through more familiar supply chains. Kerosene not completely eliminated - People who adopt improved lighting do not universally eliminate kerosene consumption (some even increased consumption from the baseline). This is because people may continue to use their fuel-based lighting product(s) in addition to their new LED lighting products. The LED lighting adopters in our study achieved a mean reduction from the purchase-time baseline of ~50% (and substantially more if compared to rising use among non-adopters). Moreover, a 50% drop in kerosene prices during the time of the study induced non-adopters to increase their kerosene use by 70%, whereas the adopters achieved significant absolute reductions. Notably, about 60% of adopters eliminated all kerosene use for lighting. Several adopters noted the benefit of LED lighting in eliminating their exposure to fuel price volatility. Higher-brightness products may achieve greater offsets, and other studies indicate more successful conversion rates with more modern technologies. Market spoiling from low-quality LED products – We observed a strong and statistically significant market spoiling impact of exposure to low-quality LED flashlights on peoples’ choice to purchase better quality LED task lights. People with prior exposure to low-quality products were much less likely to purchase LED products in general. Acknowledgments: This work was funded by The Rosenfeld Fund of the Blum Center for Developing Economies at UC Berkeley, through the U.S. Department of Energy under Contract No. DE-AC02-05CH11231. Art Rosenfeld has been a key supporter of this work. We wish to extend special thanks to the many people in Kenya who participated in this study. We are grateful to Maina Mumbi for his expert contributions to the fieldwork, and to the entire Mumbi family for hosting our team in Maai Mahiu. Thanks also to Kyle Palmer for leading the design and fabrication of micro data loggers for our study.